It's a question most of us will have asked at some point: exactly how does Santa Claus get around every kid in the world on the night before Christmas? Well, we're not completely sure, but we've been crunching some numbers and working out how it could be done. If you've been wondering just how quickly Santa's sleigh needs to fly, or how big it would need to be to fit everyone's presents in, or whether reindeer really can take to the air, we've got answers for you - even if you don't really believe in Father Christmas. 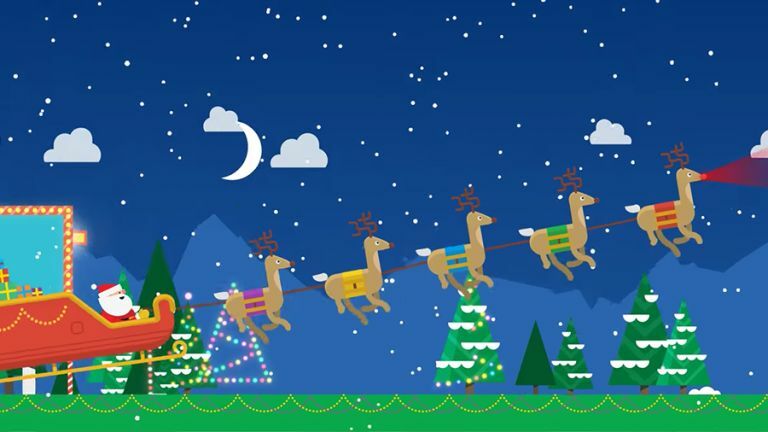 Images taken from Google's excellent Santa tracker. Santa needs a sleigh capable of carrying plenty of presents. For simplicity's sake, we'll say he has to carry one present for every child on Earth (get your own gifts, adults). That means, based on several estimates we've found on the web, about two billion kids aged under 14 who'd want a gift. For now we'll ignore religious beliefs and how well these children have been behaved, otherwise we'll be here until next Christmas trying to work out who qualifies and who doesn't. Again, just to make the calculations easier, we'll say everyone's getting the same thing - a Rubik's cube. Not the best present for a two-year-old, admittedly, but for simplicity's sake all the world's children are getting something of a similar size and weight this year. A Rubik's cube weighs 100g, Amazon says, which means Santa's sleigh is going to weigh 2 billion grams, or 2 million kilograms, or 2,000 tonnes, plus the wooden sleigh and Santa himself. That's approximately the weight of four-and-a-half Boeing 747s. Capacity-wise we need a little under a thousand cubic centimetres per gift - in other words, 1.9 million cubic metres in total. Very roughly speaking, one-and-a-half times the capacity of the bowl of Wembley Stadium. So - a sleigh one-and-a-half times the size of Wembley, weighing the same as nearly five passenger jets, is taking off from the North Pole on Christmas Eve. Shouldn't be too difficult to spot. The next scientific conundrum to consider is the speed at which Santa Claus needs to make it around the planet to get to everyone and leave no child disappointed. Thanks to the rotation of the Earth and the shifting time zones, most experts estimate Father Christmas has about 32 hours to start and finish the job. With 2 billion kids to reach, we're talking less than a fraction of 1 percent of a second per child - not ideal when you're shimmying down the chimney and trying to find somewhere to park the sleigh. To put it another way, it would mean visiting a little over a million kids a minute. In this case we'll just have to assume Santa has some kind of North Pole magic (or an elaborate in-flight present delivery system) to get all those presents out in time. At least his sleigh will get lighter as he does so. An easier approach is to think about how fast Santa and his sleigh would have to travel to get around the globe. The diameter of our planet varies depending on which bit you travel round, but it averages out at about 7,918 miles. For Santa just to get around the globe in 32 hours, he'd need to be travelling at almost 250 miles per hour. Not unreasonable at all - the aforementioned Boeing 747 has a top speed of 570 mph - but how many times would he need to circle the Earth? 100 times? 200 times? Unfortunately there just isn't the data available to work out an exact distance between all the houses of all the children in the world, but if Santa did the equivalent of 50 full circles of the planet, using his magic present-spraying machine all the while, he'd need to go at 12,500 mph, almost twice the speed of sound. And finally: can reindeer fly? Also worth asking in our scientific breakdown of Christmas: can reindeer really fly? Well, not as far as we know - but it's possible they keep their abilities under wraps from the world until Christmas Eve. A whole host of explanations have been put forward by scientists down the years, from genetic engineering to special breeds of reindeer that have evolved stomachs filled with hydrogen to propel them into the air. With so many living organisms on the planet yet to be classified, it's not such a stretch to think there are flying reindeer yet to be discovered by our scientists, but of course they would have to be super-strong as well as able to fly - tradition says Santa has nine reindeer, and they have to pull the equivalent of four-and-a-half Boeing 747s. Hopefully that should have answered some of your Santa science questions, just in time for his latest round-the-world trip. Don't forget to leave out a mince pie for him in advance - while he has most of the year off, Christmas Eve is a pretty intense working day. In the Christmas mood? All our gift guides in one place.